Before I go any further, I want to give a H-U-G-E shout out to dayf for taking over the reins this past week while I was on vacation! I cannot tell you how much I appreciate you offering to post while I enjoyed time with the family and got to meet Play at the Plate! Sorry I did not post on the 4th, but I ended up with some kind of cold or something and was basically knocked out from the time we got home until about 2pm on Sunday. When I got back, I had a bubbleope from GCRL! Inside, a stack of Indians cards (wow, I am soooo behind on posting the great cards folks have been sending me!) and several packs for us to open. 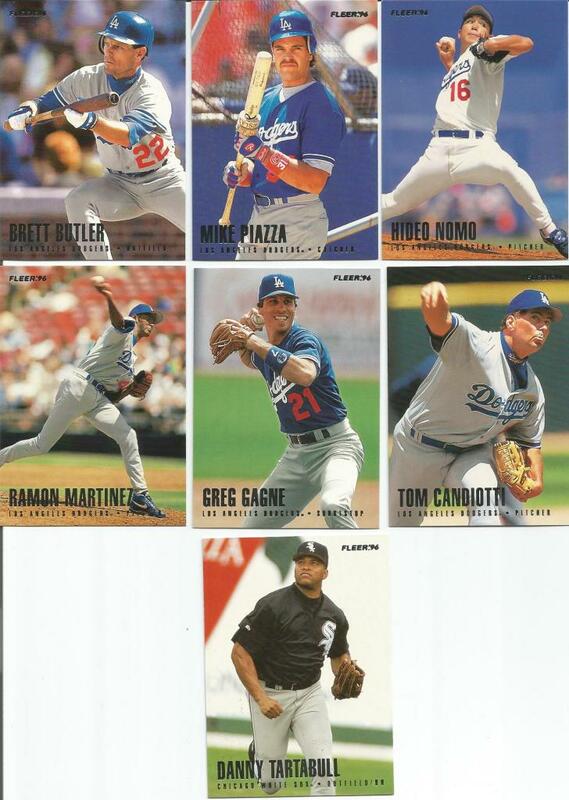 So, tonight, I am opening one pack of 1996 Fleer Dodgers and one pack of 1996 Fleer White Sox! Congratulations, managers! It's always good to see the person who sent the packs pull a players, and I am always partial to any pack that adds a player to my own stack! Robin Ventura is a free agent? I checked all my files and it seems that is so. That just seems weird. Same with Cuddyer from the other day. I looked and came up empty. Well, thanks to the Captain for saving us from a shut out pack! !